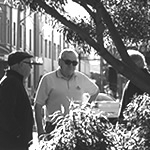 The Newtown and Erskineville area has become well known as a gay and lesbian meeting place. With numerous gay friendly cafes, bars and restaurants, the area attracts gay and lesbian people, as has Oxford St, Darlinghurst and at some points, Leichhardt during this time. 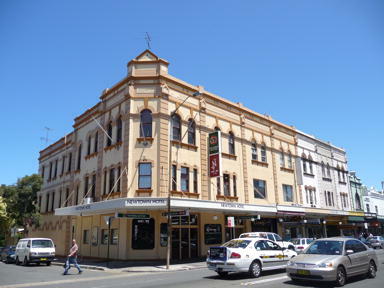 Hotels such as The Newtown in the early 1980s and Ceccinis on King Street, the lesbian bar Champersand the Imperial in Erskineville, where famous drag shows like Priscilla were held are strongly associated with the gay, lesbian and transcommunity. It is quite likely that Aboriginal and Torres Strait Islander gay, lesbian and trans performers have lived locally in order to be close to their work places and friends and may have performed at such venues. This is an area where an oral history approach would be effective. Aboriginal and Torres Strait Islander people have often endured racism and prejudice from gay and lesbian communities and within Aboriginal communities too, and have built their own networks in their place. 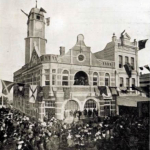 In 1988 a striking comment on the Bicentenary was a Mardi Gras float, ‘sailed’ by an Aboriginal Captain Cook (Malcolm Cole) . 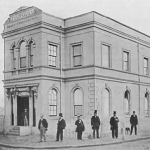 Later, the Mardi Gras workshop, where many floats for the parades were designed and made, was located in Erskineville on the corner of Gowrie St and Erskineville Road. It is likely that Aboriginal and Torres Strait Islander people were involved in preparing key floats. In 1998, a sand goanna made by Mardi Gras artists and the Nitdethana project participants (Moree) and the rainbow serpent of 1999, again made with people from Moree, were likely to have been stored and assembled at the Erskineville workshop. A ‘Pink, Black and White’ Reconciliation float consisting of numerous Aboriginal and Torres Strait Islander and non-Aboriginal supporters was a feature of the parade in the late 1990s. Brown Shuga (aka Craig Greene) an Aboriginal drag queen, performer and artist, originally hailing from the NT, also appeared in the float for House of Blackstar during the 2010 Mardi Gras parade. Mardi Gras consists not only of the famous parade, but also a diverse cultural festival, which the parade and party closes. Another key event of the Mardi Gras Festival in 1997 was an exhibition of Indigenous lesbian and gay artworks at The Raw Nerve Gallery in Erskineville. The exhibition featured performance and the works of Indigenous artists such as Brook Andrew (of Wiradjuri background and born in Enmore), Deborah Breckenridge, Kevin Butler, Karla Dickens, Sue Green, Michael McLeod, Rea, John Smith and Ken Watson. The exhibition was co-curated by Ken Watson and Wendy Brady. Brady’s grandparents moved from Wagga Wagga to Erskineville at the turn of the century to escape the enforcement of the Aboriginal Protection Board child removal acts. She has since been a member of the Mardi Gras Board, responsible for organising the festival and the parade and is an academic working on issues of Indigenous peoples and higher education. House of Blackstar, an organisation established in 2008 by the Aboriginal performers Blackbooty Supream, Brown Shuga and Pepa, to provide support for sistagirls, (transgender and transexual Aboriginal and Torres Strait Islander people) and health education and well-being programs and events held a fundraising Mini Ball at St Peters in 2010. Advertising for the event made teasing references to the attendance of people from the Eastern Suburbs and Newtown as coming from ‘across town’ to ‘St Petersburgh’. Another key Mardi Gras event, which Aboriginal people have been involved in, is Fair Day, usually held at Victoria Park, near the intersection ofCity Road and Parramatta Rd. This has also been a site where gay and lesbian reconciliation groups held information stalls from the mid to 1990s, such as Black, White and Pink and Queers for Reconciliation (working with CAR) in 2000. More recently, House of Blackstar have been prominent at Fair Day in Victoria Park. 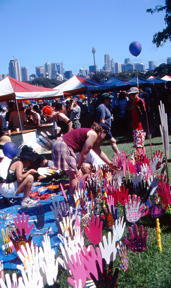 Victoria Park has also been the site of mini Tent Embassy in 2000, as a protest during the Sydney Olympics. The park has also been used at other times to protest the lack of representation and consideration of Aboriginal people and their rights, echoing the intent of the original Tent Embassy in Canberra in the 1970s.